"Saddam Hussein has accused prosecution witnesses at his trial for genocide against the Kurds of fuelling division and hatred among Iraqis. He was addressing the court after several Kurds testified about atrocities allegedly committed by government forces in 1988." Read more at BBC NEWS. 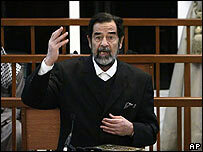 Does Saddam have to pay the Democrats a royalty for using their idea or is it the other way around? Saddam's and our Liberal's arguments on Iraq are the same; 'If you fight back the fight is your fault'. Well, yes. It is our fault. Everything is our fault, even if we don't fight back. whatever it is .... it is your fault.